Each year, International Holocaust Remembrance Day comes around almost as a surprise to me. It doesn’t bring the tears and the dread that Israel’s Yom HaShoah brings. It is simply a day, suddenly thrust at me, telling me that others are remembering the Holocaust and promising not to deny it. It was voted into existence, this yearly event, by the United Nations, on the initiative of Israel and so, each year, on 27 January 1945, the day the allies liberated the Auschwitz-Birkenau death camp, there are speeches and gatherings, candles lit and many pictures are taken. I don’t mean to sound cavalier. I don’t mean, in any way, to lessen the importance of the world stopping to remember. The problem isn’t January 27th, it is January 26th, and January 28th. On those days, too much of the world does deny; too many abuse the terms and cheapen them. You don’t like a politician; he must be like Hitler. A policeman is abrupt or rude; he must be a Nazi. I woke to a computer showing me a picture that I posted to Facebook two years ago. I love the picture and have a very special relationship with the little girl there. I never met her; but I loved her sister as a second mother to me. 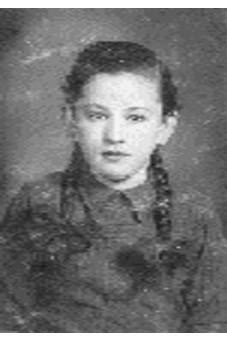 If the Nazis had never entered Czechoslovakia, Gavriella would probably have been a much loved aunt to my children, as her sister, Klote was. the child stayed with her, the Nazis would kill her. Gavriella didn’t want to leave her side but finally was persuaded. As she walked across to her sisters, a Nazi guard – may his memory forever be cursed, made the child return to her mother’s side. She and her mother were gassed to death. The word that comes to mind is not one that I can write here. We will NEVER put this behind us. We will, and do, pass this to our children and they will pass it to their children. What you “forget,” you are destined to relive. There will never be another Holocaust – not because you in Europe and Germany deem it so, not because you have learned how wrong it is to hate another…there will never be another Holocaust against the Jewish people because WE will not allow it. You appear to be little different than you were 70 years ago. Oh yes, you’ll march in the streets and join hands in sympathy and condemn anti-Semitism, but when they murder and beat Jews in your midst, you do not take action…but we will. We will not forget. We will not “put this behind us” and we sure as hell won’t let the Germans put it behind them either. The nation…the people…of Israel live. May God watch over little Gavriella for all eternity – she will live on, God willing, in the generations and generations to come. Today, as the world remembers, I live the only answer I could imagine to the Nazis and yes, even to Holocaust Remembrance Day. Little Michal Gavriella is an insanely beautiful, happy Israeli child who chatters away in a mixture of Hebrew and English. She is celebrating the birth of her newest cousin, named in part after a Holocaust survivor. Today, as the world remembers, my daughter Aliza sleeps after a late night with her friends. She slept over but didn’t sleep well. She wanted home and now she’s home dozing on my couch. She is named for Gavriella’s sister. I’m glad there is an International Holocaust Remembrance Day, though it is so different than our own Yom HaShoah. On that day, here in Israel, our world stops…literally. An air raid siren sounds and Israel comes to a halt for two minutes and in silence, in the streets, in the shops, in the schools, even on buses, people stand and remember. And then, as we do this day, we give our answer back to the world. Once you killed us, gassed us, burned us, shot us. You put us in ghettos…or you were mostly silent when others did. Once you burned our synagogues and desecrated our graves. It is not our way to respond in violence and so we give you the best answer, the only answer. We live. So today, as you remember, we live. My house is full of the scents of Shabbat. I have cholent (a long cooking stew blend of meat and potatoes and barley and wheat and beans) cooking on the stove, and chicken soup made the way my family loves it. Soon, I’ll put the potato kugel (casserole) that my mother-in-law made each week into my oven. I’ve got some salads to make; the chicken and vegetables are almost done. Life. It is the only answer we can offer to those who hate us. It is the best answer of all.